Silk – our Queen of fabrics Silk is a special fabric that fascinates with its elegant sheen. Light and soft with the capacity to warm us, if it is cold and cool us, when it is warm, silk is an ideal material for scarves. In addition, silk takes dyes very easily and is therefore an ideal basis for our prints. We exclusively use silk as canvas and the screen printing is hand crafted. This process makes every scarf unique. The colours dry matt on the shiny fabric, almost creating the impression of a relief. 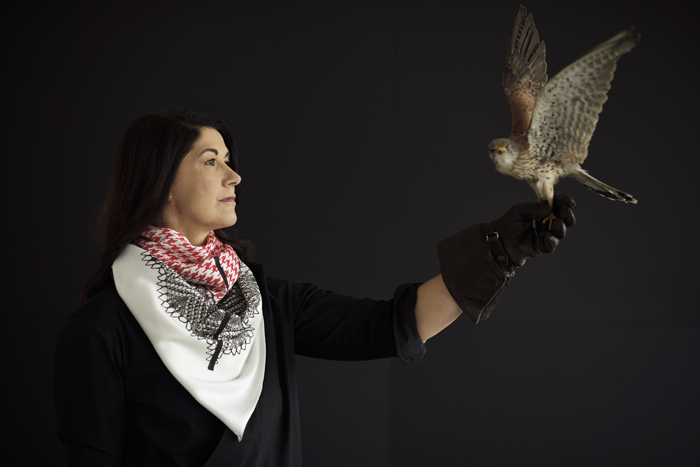 The Design – We each design the motives and patterns for our scarves; looking carefully, you can see a different hand and approach. 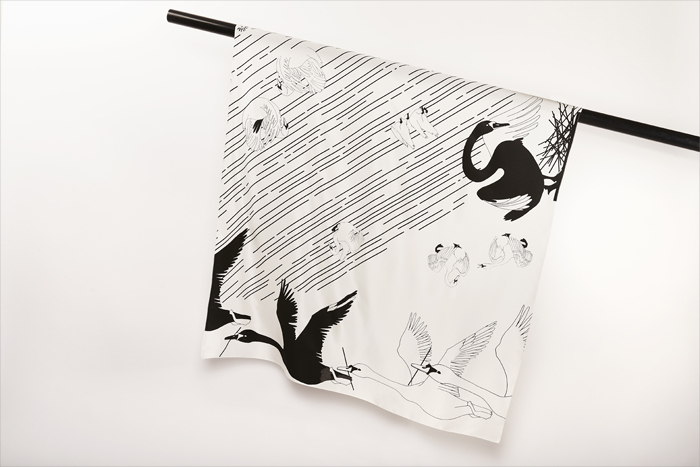 On Britta Jonas’s scarves, the gentle strokes and silhouettes whisper a story – little hobby horses that must be tamed with a lasso, quiet anglers beside even quieter pools and again and again small, nimble gloved hands trying to arrange disorderly patterns. Irina Clausznitzer works with shapes and patterns, combining, superimposing, sifting out until the final idea crystallizes. 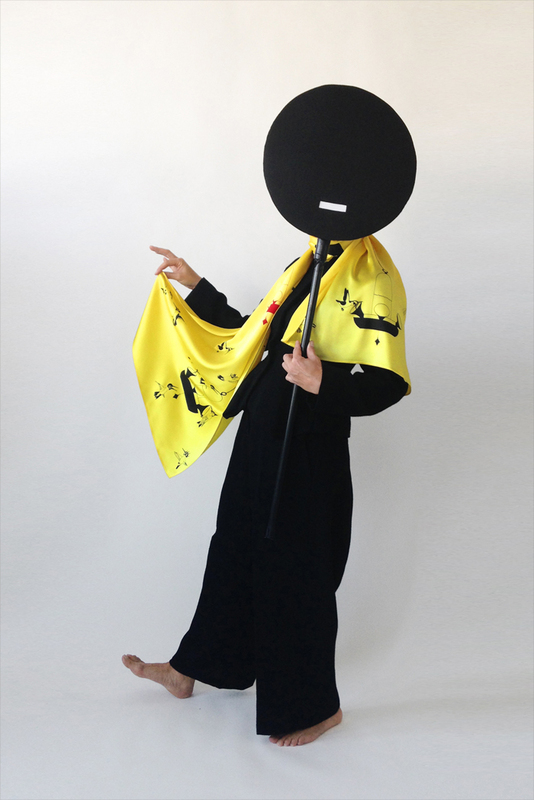 In this way, abstract pictures are formed, which combine or contrast depending on how the scarf has been tied. It is important for us to create something unique, lovingly-handcrafted, distinctive adornments and wearable works of art. The Edition – For TUCHDRUCK JONAS & CLAUSZNITZER, we print a limited number of 20 – 40 copies of each motif. The number of a particular scarf in an edition is noted on the accompanying card. The Finish – Our collection is designed for those who like something special and individual and who attach importance to subtle differences. 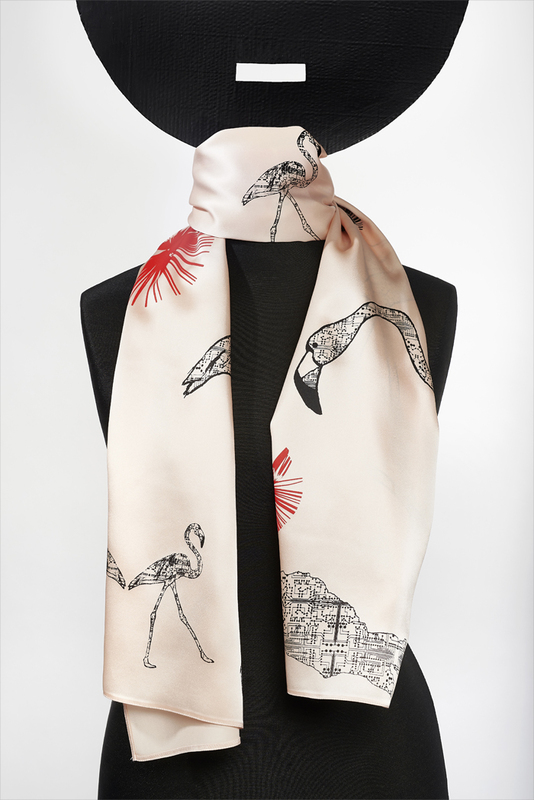 Each scarf is printed in Dresden and completed with two seams carefully stitched by a Dresden tailors workshop. 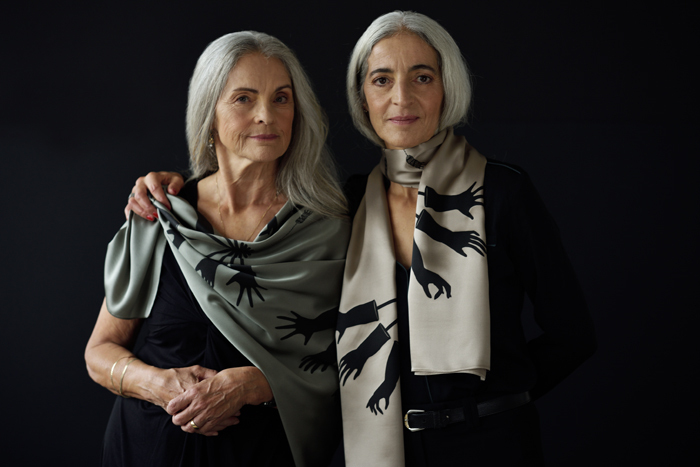 Our manufactory was founded in 2013 in Dresden by Britta Jonas and Irina Clausznitzer. Britta Jonas studied art at the Dresden Academy of Fine Arts. Now she lives and works in Dresden and Frankfurt and Main. 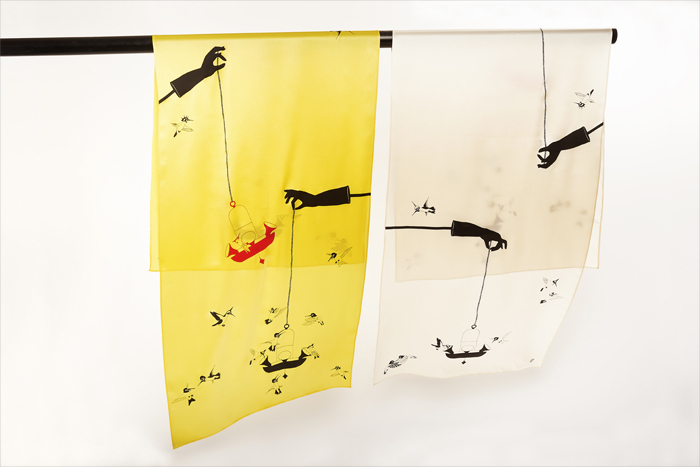 In addition to three-dimensional work and making animated films, silk-screen printing on various materials is also an important part of her oeuvre. TUCHDRUCK JONAS & CLAUSZNITZER is a cooperation with Irina Clausznitzer and part of her label by Britta Jonas. 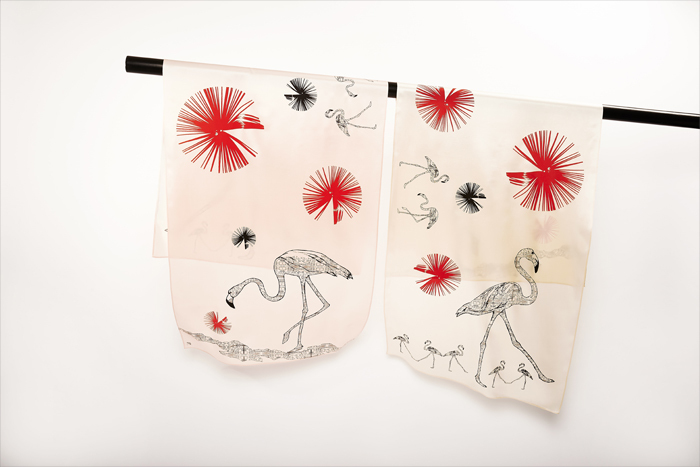 Since 1993 Irina Clausznitzer has been head of the workshop for silk-screen printing at the Dresden Academy of Fine Arts. 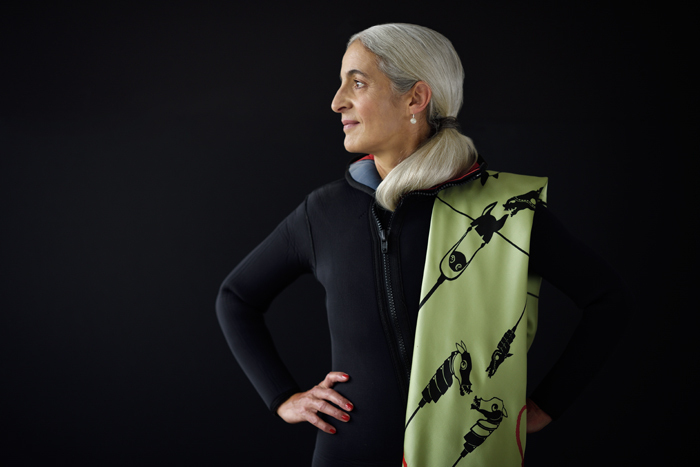 She also manages the RAUTEDRUCK – silk screen print workshop where she produces screen prints (serigraphs) for well renown, Dresden based, artists. For more information or to make an appointment in the studio please contact us: TUCHDRUCK JONAS & CLAUSZNITZER Britta Jonas or Irina Clausznitzer at tuchdruck@gmail.com.